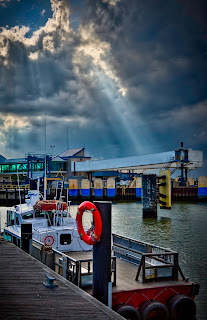 Sun rays peak through threatening skys over the Lewes-Cape May Ferry terminal in Lewes, DE. Camera- Canon EOS 50D, Lens- EF 16-35mm f/2.8L II @ 31mm, Settings- f13, 1/400 (median), ISO 400. With the camera mounted on a tripod, five exposures were captured in RAW format with a 2ev spacing. After noise and chromatic abberation correction in Adobe Camera Raw, converted Tiffs were loaded into Photomatix pro 4 and merged. 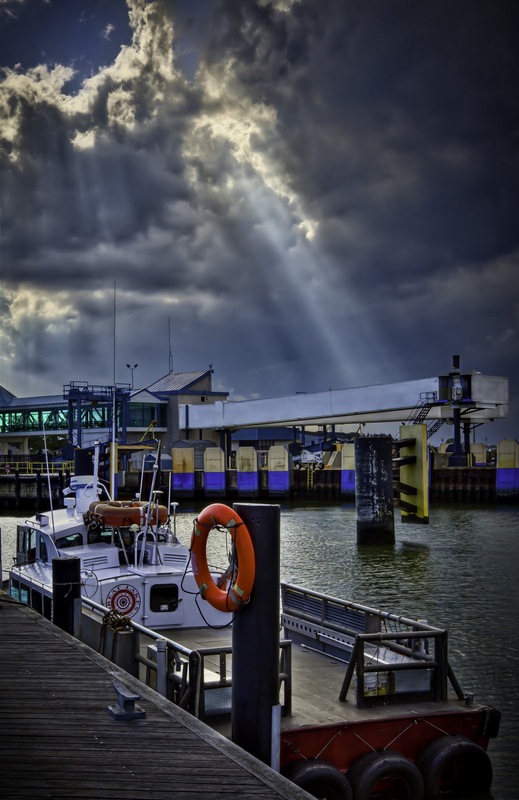 The HDR file was saved and then tonemapped three times to emphasize different parts of the image. One version concentrated on the sky steering clear of halos. Another version highlighted the boat and terminal. Finally, a "highlights and shadows map" was created to bring back detail in the sky. The three differing versions were loaded into Photomatix 5 and blended using masks, blending modes and adjusted opacities.